Well the sunshine continued and we had a nice breeze top of top suit for most of the morning with a few nose dives but not enough to encourage rig changes. Dave Green sailed his normal impeccable series of races only occasionaly being knocked off the top spot . The wind direction was such that we probably should have moved to the spit halfway through but we didn't and the start line was less than perfect but we had a good beat from the white by the right hand island to the red 7 and many position changes during the beat which sometimes favoured the outer line and sometimes the inner line. A good mornings racing with an unexpected bonus in the John Clifton came down to spectate for most of the morning great to see him out and about again he is threatening to descend on the Wednesday morning crowd so be warned. Today's TIRYC Trophy session was no joke: it was still cold although what little wind there was came almost from our ideal direction but not quite enough for a start between the left hand launching pad and the western island. So we started between orange 8 in the eastern bay and a pole in an attempt to give an equally biased line: that failed but did give us a fairly challenging first leg to the furthest orange mark out in the distance which was taken to port and followed by an almost dead run to orange 7 at the extreme left hand end of our water. After taking that to port we headed for orange 6 in the mouth of the western bay, rounding it to port we set off to the windward mark from where we returned to orange 7 and then to finish between the nearer two white marks just off the left hand launch pad. Although including some apparently heavily biased legs, the course gave lots of opportunities for finding the right, and wrong, ways to the next mark with numerous changes in position within the small fleet. We would have been six had it not been Mike Ewart's turn to leave something turned on overnight: this time it was his transmitter which was exhausted when the time came to sail. Mike had no option but to pack his boat away and stay on in the cold with us to 'officiate' until his senses told him to return to the warmth of his home. 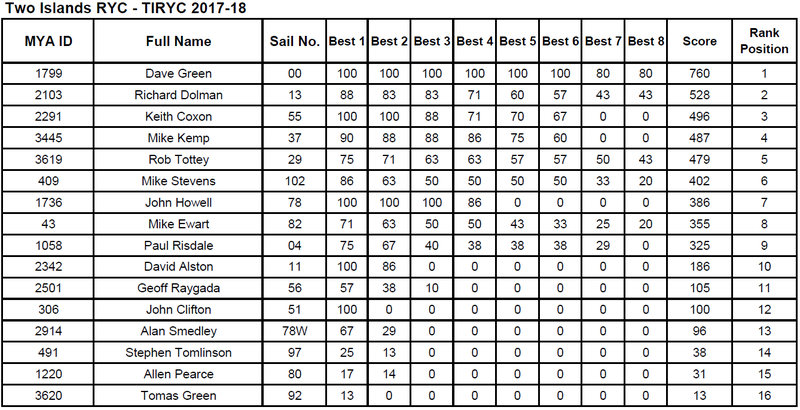 As the score sheet shows, the places were spread between most of the fleet: the notable exception being Mike Stevens who managed to get his boat 'tune' significantly wrong this time. The other sailors all 'helped' with his rig at times during the morning which slowly saw Mike getting closer to the pack as the morning wore on until he was well into the group in the last race. Dave Alston shared some his significant tuning skills with Mike during a car park session on Mike's boat before we packed and went our separate ways. It was relatively warm and bright and all in all a very pleasant morning racing with 12 races completed. After the cancellation of Wednesday and Friday sailing last week some of us were keen to sail on Sunday, well just three of us in truth! However we were out and sailing. As can be seen Dave was in dominant form although KC was at time hot on his heels and in one race we were separated by literally a front bumper. Rob manfully followed us round with a satisfying second place in Race 7 Yay! As with the previous two days this weekend, the wind was from an Easterly or South Easterly direction which meant that we had a different set of 'island shadows' and streams to deal with. The course was from white 1 & 2 just off the left hand platform, out to the middle of the five whites lined up around the front of eastern island, off to the second of the orange marks and down to Orange 7 to our left; all to port. Using the port rounding of orange 7 led indirectly to several significant 'give way' situations where boats coming down the 'run' failed to keep clear of boats making their way back up to windward: with everything just in front of the skippers there shouldn't really have been any difficulty - but I suppose that's just my opinion showing through in this report. The wind, being borderline 'change to B rig' strength caused numerous borderline 'out of control' situations, I was just thankful that my Fraktal seems to be remarkably stable with its rudder in the air even though I couldn't change direction until it returned to the water. Only two skippers avoided missing at least one race due to rig failure of some sort: Keith C. was really on form and only failed to win just two of the dozen races we fitted in between 10 and 12. Mike K. finished second overall after managing to stay on the water throughout, delayed in one race by retrieving to empty a considerable quantity of water from the hull having forgotten to put the drain plug in before launching at the start of the morning. Richard was slow to start, but came good in the latter half, having fixed the odd gremlin: Mike S. suffered a failing backstay which brought his morning to an early end and Dave Green retired as well after his boat had taken a heavier pounding than normal. Seven IOM’s out to play today with a few absences from regulars who are maybe on half term duties or for other reasons. In particular the front runners of John Howell, Dave Green and Mike Kemp were away allowing those of us lower down the running order to have a chance of glory! “In the absence of any of the normal “Gaffers” we managed to assemble a score sheet, clip board, starter and finally a pen that worked. On a bright but brisk morning the wind was in our faces from across the lake so a course was set that took us from a starting line using the edge of the left hand jetty and white 3 out to the windward mark just off the right hand island back via a spreader to orange 7 in the bay to our left and back though the starting line, before repeating the course. There was a delay at that point as the strengthening wind caused everybody who had a “B” suite to change. (I really must get in the habit of taking it with me). John Howell showed his normal mastery of the conditions over the morning, as you can see from the score sheet, losing only only two races. Rob Tottey managed his first win with his BritPop, (sure he will buy drinks all round next time at the Old Beams) . I managed to take one race when the wind dropped for a while by using my larger sail area to good effect. Several skippers suffered mechanical problems, Dave Green, normally a front runner, suffered a total power failure. His boat took some time to meander around Furzton before ending up in the far right hand corner of the lake. He tried again with a fresh battery only to suffer the same problem as soon as the boat entered the water. Stephen spent some time on the jetty with his boat and then disappeared, probably an attack of common sense that caused him to seek a warmer place. Paul had problems with his jib at the end but stayed to use his starter for the last race. The “B” rig was probably the correct one for the morning as John Howell showed. The temperature was up, just about in double figures, and the wind was in double figures too - every now and then anyway. Nominally from the South West but when 'filtered' through all those houses and around the left hand island it was broadly in the SW direction and anywhere from 'becalmed' to 'rudders waving in the air'. As a number of us were loth to sail from the spit a course was set with a port tack start across a line between Orange 6 and a post somewhere around the right hand end of the right hand launching platform. From there we headed to White 3 and then to White 1, close to the left hand launching platform, Then it was off to White 6, off the spit, and back up to Orange 7 before returning to White 6 and back to finish between White 3 and the edge of the LH platform. Apart from the first 'dodgy' port tack approach to the first mark we had a couple of good, challenging, beats and deceptive runs where the wind saw yachts becalmed one moment and on the verge of broaching a few seconds later. The course gave plenty of opportunities for making and loosing places between windward and leeward marks; again there were some very close finishes with places being decided by a few centimetres - or less! The fleet of ten yachts was reduced occasionally due to rigging failures. Geoff had backstay problems and returned to the water carrying 'B' rig but, unfortunately for him, the wind was not consistently strong enough to give him an advantage even though some of us considered changing down at times. Mike Ewart withdrew a few races later when his winch line parted, not something that is easily repaired in the time of a couple of races. As is becoming a feature of our club meetings, competition was pretty close although there were only two tied scores: Mike Ewart took this tie by way of his best 5th place compared with Geoff's best of 7th. If you didn't sail your One Metre today, you missed a great session. Ok, it was cold but that was largely as a result of wind-chill from a mid-teens mph wind from the North East moving to ENE, an almost perfect direction for our sailing area coming to us with little interruption from buildings, islands and all that stuff. Eight skippers took to the water with only two of us, Mike K. and Mike S., initially in 'B' suit. Mike K's race 1 runaway victory under full control contrasted with the battles of the 'A' rigs to make it around the course from White 1 / White 7 up to Orange 3, then Orange 4 down to Orange 1 in the left hand bay, back around Orange 3 and Orange 1 to a short dash to finish across the same line as the start. The start of race 2 was delayed somewhat by a mass conversion to 'B' rig which proved to be the one to use and resulted in some close racing which was eventually dominated by John Howell, though he was challenged from time to time and even became embroiled enough to be caught in the odd mix up of yachts as they fought to round the windward and leeward marks. Sadly, Richard Dolman's participation in sailing was cut short by some mysterious mechanical problem involving his 'B' rig gooseneck which refused to work properly; not something easily fixed at the lakeside in brisk, cold wind and with frozen fingers. Richard kindly stayed on to take charge of the starts and scoring. By the time we had completed ten races the wind was bordering on sufficient to bring out 'C' suits, something not often seen on our water - like the 'white horses' beginning to appear trotting down the lake: a rough 'rule of thumb' means that the wind had reached 25 mph. Now that would have been exciting! Please find attached the results of today's TIRYC One Metre sailing, results and summary courtesy of Mike Ewart. A small but select turn out today Dave Paul and Richard sporting full suits and the rest with B suits it really was an A suit day for 90 percent of the time apart from Dave we all had some good racing Dave decided to play at the front so we let him, an excellent days sailing from him, the weather was overcast and as I said top of A suit with a course up and down the lake we had a practice race and then 13 races good fun had by all. Best wishes for Christmas and, if we don't meet before, a Happy New Year. What a change from Friday! Sunday turned out to be relatively warm, enough for some to shed their gloves, though not their jackets. The wind had abated from what greeted the DF95 skippers and was a reasonably consistent light North North Westerly which meant that we sailed out of the 'right hand bay' to the left most orange bouy between the islands, took it to starboard and around the next orange bouy also to starboard. The leeward mark was orange again down in the bay, rounded to starboard - to avoid too many mental adjustments - then back up to the windward orange mark, back to leeward and finish across the same line which was between a mark and the very imposing tripod mounted pole on the bank. Dave Green was in terrific form with a string of first places even though several gave significant chase around the course. Behind first place the fleet was a closely contested affair with places being swapped all around the course: often first and second places had the pack charging down towards them as the wind built after one of its lighter moments downwind. A good turnout had a pretty good morning's sailing with none of the major gear failures experienced in the previous round, though Dave Green reported suffering occasional glitches with his controls: he suspects it may be his transmitter 'playing up' after having methodically going through all the radio components on the yacht; it didn't show Dave, or well done for surviving the glitches! We had a little more wind than was present on Friday and from a direction that allowed us a reasonable start from the red and white marks just off our normal operating position followed by a somewhat lopsided beat to the far left hand mark which was taken to port. From there we ran / reached to the middle of the three white marks in front of the western island, passing around an orange 'wing' mark in the mouth of the right hand bay. The main beat back to the windward mark was followed by a run to the leeward mark, then back to finish across the same line used to start. Wind and wave conditions resulted in some relatively close racing with no one boat persisting in any position, except for 28, Mike Ewart, who suffered terminal winch failure before the first race had actually started. Mike earned his 'attendance points' by manning the score sheet while the rest of us got on with racing. Dave Green, Keith Coxon, and Mike Kemp spent the first seven races closely contesting the first few places until, in race eight, Mike's winch failed with a severe case of the jitters which unwound its control line and caused Mike's retirement from the morning's competition. Paul Risdale's rather nice wooden planked hull collected several third places and looks like being 'one to watch' for future events. “Guy Fawkes morning saw a bright but chilly day with a light wind ( which would strengthen through the morning ) from the North West. This meant that the standard course for the last month or so was set, start between the buoys in front of the jetty, into the left bay round red 7 across into the right hand bay round red 8, out to a white buoy to the right, back to red 7, back to a white buoy to the right and then finish where we started. The first three races proceeded according to form. John Clifton edged race one with Dave Green taking the next two. At that point Dave developed problems, apparently power related, such that he disappears from the score sheet, after causing mayhem at a mark with an out of control boat. I started to have rudder problems about that time but unwisely soldiered on. During this time John Clifton took advantage and put in a series of good results. It was at this stage that Allen Pearce had a problem with his rig and retired and my rudder problems increased such that I lost all directional control and my boat, after a brief flirtation with one of the islands, proceeded across the lake and moored up in front of the car park on the opposite bank much to the amusement of the onlookers. The other happenings at that time you will have to deduce from the score sheet.